JURUNATURE is proud to represent AIMS of the United States, who are the leading supplier of molded fiberglass grating to the offshore oil & gas industry. AIMS and its sister company, Delta Composites, LLC, jointly own the intellectual property and the manufacturing of both the molded and pultruded fiberglass grating products. The molded fiberglass grating product is sold as DeltaGrate HS Molded Fiberglass Grating. (HS is an acronym for "high strength".) Our manufacturing process utilizes a proprietary manufacturing technique that allows us to introduce more glass rovings into the laminate. Essentially, a fiberglass grating consists of two components-fiberglass rovings and resin. The glass provides the strength, and the resin provides the resistance to the environment (i.e., the corrosion resistance, the UV resistance, the impact resistance, etc.). The higher the glass-content, the stiffer the grating. As a result of the higher glass content, DeltaGrate HS Molded Fiberglass Gratings are the stiffest of any molded grating manufacturer. CHEMICAL RESISTANCE: With a variety of resins at our disposal, AIMS can provide chemical resistance to caustics and acids. IMPACT RESISTANCE: Our gratings possess better impact resistance than steel gratings and meet the requirements of ASTM 695-79 (1985) as established by the Fiberglass Grating Council (USA). FIRE RETARDANT: All AIMS DeltaGrate HS Molded Gratings are designed to achieve a minimum of a Class 1 Flame Spread Rating in accordance with the ASTM E84 Tunnel Test (comparable to UL 723, ANSI/NFPA No. 255, and UBC No. 8-1). We can vary the E84 Flame Spread Rating of any product to comply with the specific project requirements. NON-SKID RESISTANCE: All AIMS DeltaGrate Molded Gratings possess the most positive anti-slip characteristics on the market. The non-skid characteristic is provided by a concave meniscus contour on the top of the bearing bars or by a secondary application of silica grit. LOW MAINTENANCE: Install it and forget about it. It will not rust!!! 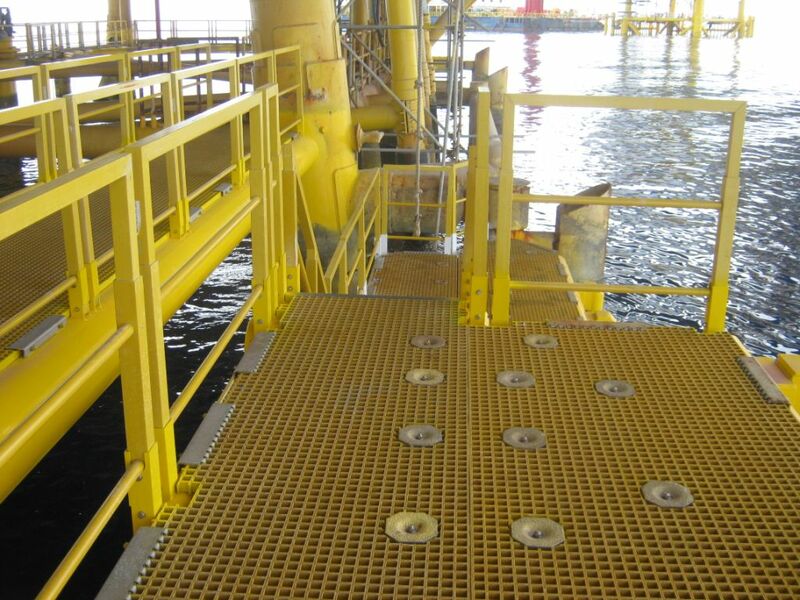 Why has AIMS become the leading supplier of fiberglass grating systems to the offshore industry? The TALON™ System!! The Talon System is a patented 316 stainless steel "wavezone attachment system" designed to restrain the molded fiberglass grating system-even when subjected to hurricane/typhoon wave action. AIMS provides a "washout warranty" on all of its offshore wave zone installations. 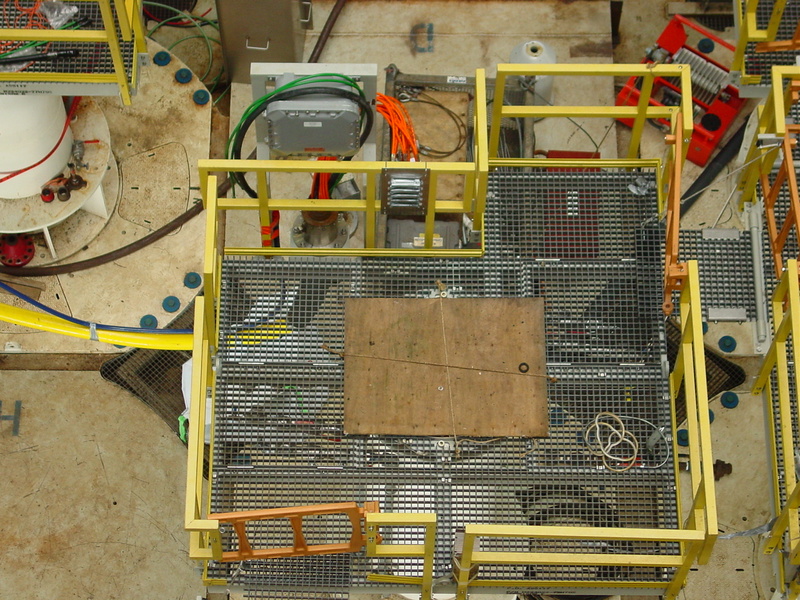 If AIMS has provided the engineering design of the system and a final inspection after the platform's installation offshore, AIMS will provide labor and materials to reinstate the platform to its original structural integrity at no charge if a wave of any source "washes out" the fiberglass grating if certain conditions are met. AIMS Fiberglass Mudmat Systems are stronger and less expensive than traditional steel mudmat systems. These fiberglass mudmats are 24 times stronger than 1/4" steel plate, and 7.5 times stronger than 3/8" steel plate. 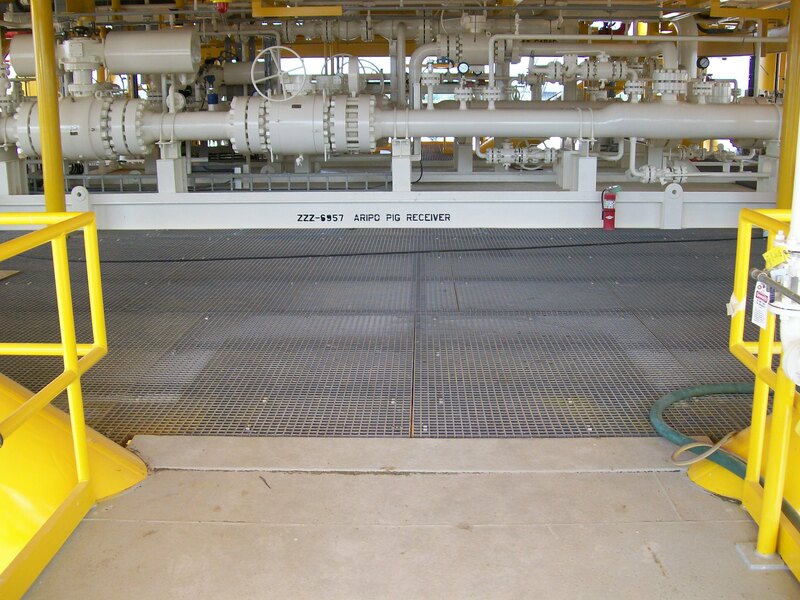 Due to the products high flexural strength (62,000 psi) and its high flexural stiffness (9,400,000 lbs-in2), the AIMS Fiberglass Mudmat System can span 2-3 times further than 1/4" or 3/8" steel plate mudmat systems. This eliminates one-half to two-thirds of the steel beams required to frame the mudmat system, further reducing the number of fabricated joints-saving both labor and steel tonnage. 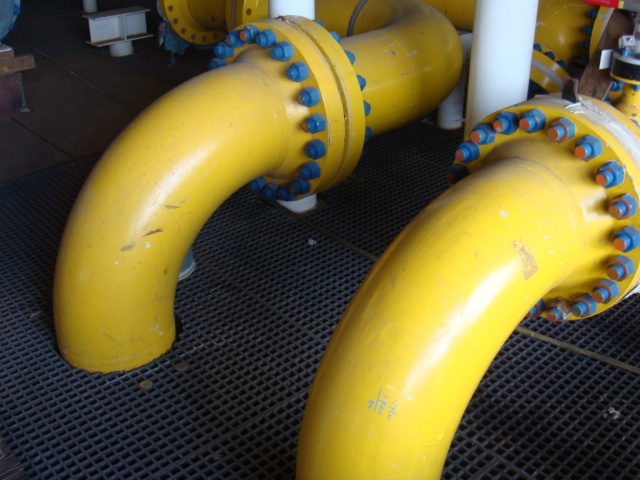 In addition to the reduction of steel tonnage and fabricated joints, AIMS Fiberglass Mudmat Systems are non-metallic, thus eliminating the need for cathodic protection. The service life of any mudmat system is very short (hours, or at most days), and after the piles have been driven, the mudmats provide no service to the structure. 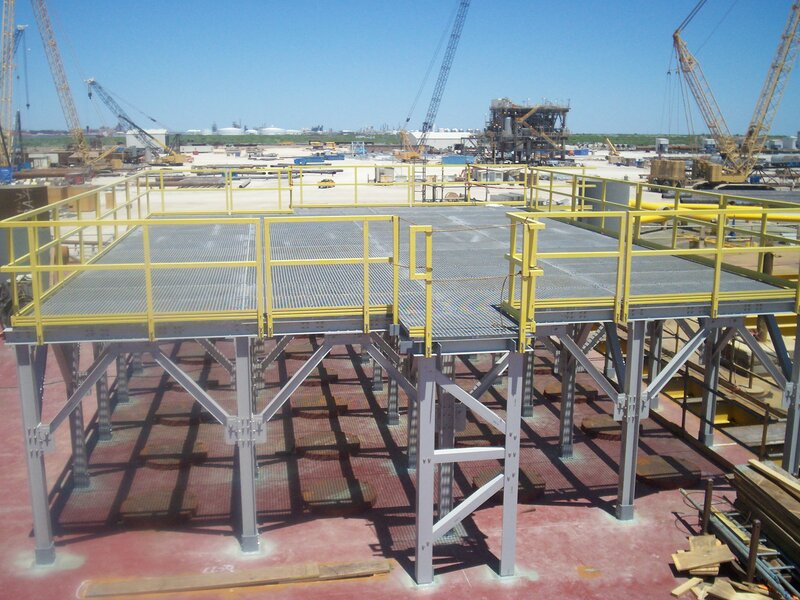 However, a steel mudmat system continues to draft from the platform's cathodic protection system. Since AIMS' planking is non-metallic, no anodes are required to protect it after its functional life-span. This is important in reducing both weight and cost of the mudmat system. The system is easy to install. There are no cumbersome bolts, nuts, nor washers-simply slide the pre-cut planks underneath the pre-designed retainer assemblies and you are finished. Fiberglass Ladders and Handrail Systems. AIMS' fabrication facility is located in an 18,000 square feet building with access to a total of 55,000 square feet, making it one of the largest fiberglass fabrication facilities in the industry. 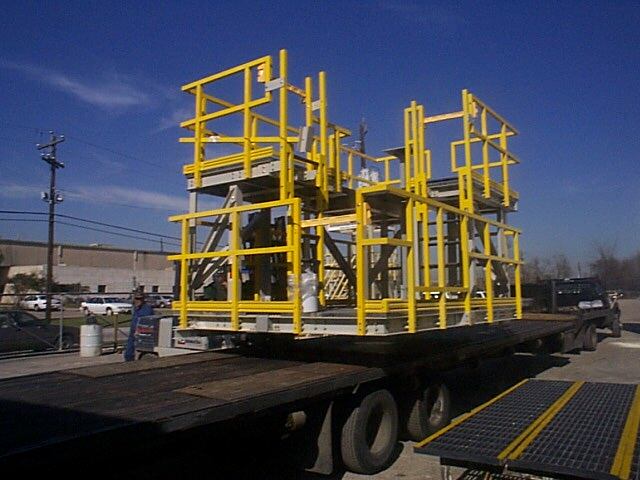 Our experienced and highly trained fabrication technicians create a quality product designed to meet the customized needs of their clients. As an ISO 9001:2000 certified company, Quality Assurance is an integral part of the fabrication process. Further, offshore and offsite installation crews give AIMS the opportunity to service what it sells. AIMS' crews have worked in every fabrication yard along the Gulf of Mexico coastline, and offshore in the Gulf of Mexico, Nigeria, Venezuela, Nigeria, and Southeast Asia.